Desoto State Park is located atop Lookout Mountain in DeKalb County, AL. On this summer day, it was a small trickle. 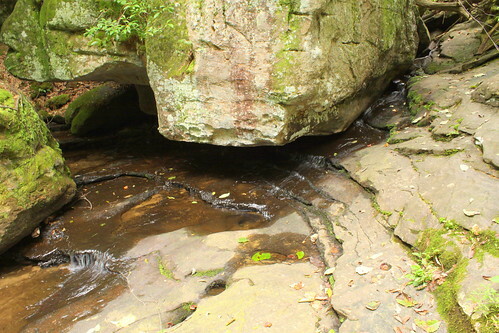 Water appears to flow out of the middle of a rock down some stones into a small stream. The cascade is easily accessible as the destination at the end of the Talmadge Butler Boardwalk Trail. The town of Auburntown in Cannon County, might be small, but they know how to have a good time. They are best known for their two big annual Fish Frys and their Red Apple Days. 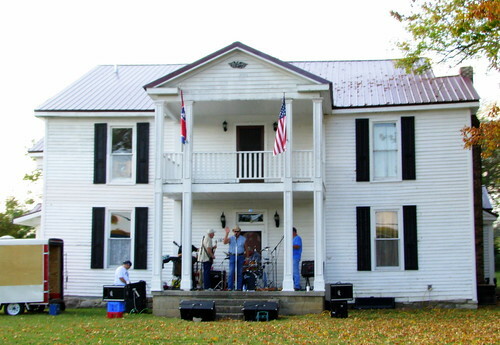 They have smaller fish fry events most every weekend through the summer and fall, and on this day a local band was performing from the front porch of this old mansion, while many of the townsfolk sat on either side of the street (TN145) in their lawn chairs. There are two well known Tennessee Whiskey Distilleries in Tennessee. While Jack Daniels is certainly more famous, they also have a more crowded parking lot and a longer wait to go on a tour. On a beautiful summer day on a Friday early afternoon, there were three of us along the tour. 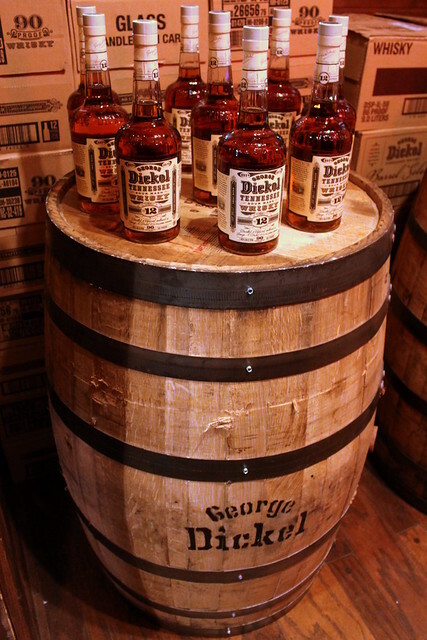 George Dickel moved to the area and bought the local Cascade Hollow whiskey in 1884. He ran the operation until 1888 and died in 1894. Then, Dickel's wife and her brother who was also an operating partner ran the business until U.S. Prohibition caused them to shut down. 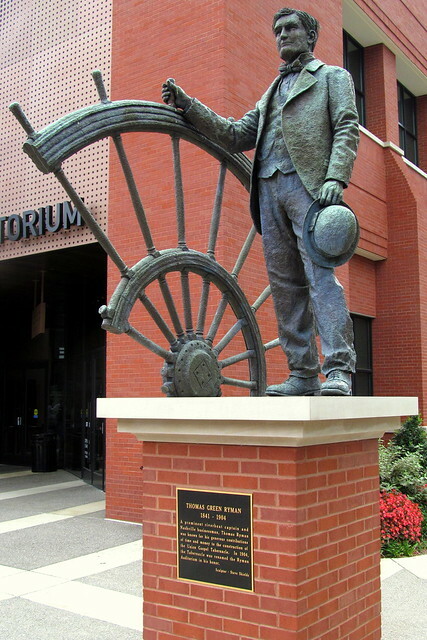 This statue by Sculptor Steve Shields of Captain Thomas Ryman is located in downtown Nashville in front of the modern entrance to Ryman Auditorium. 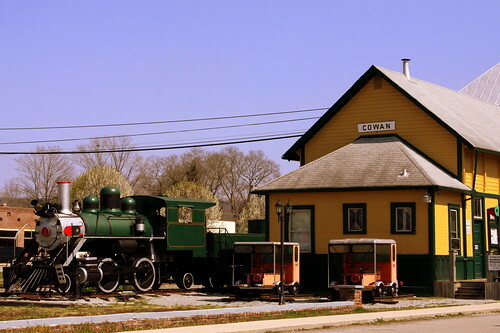 Ryman donated the money to build the Union Gospel Tabernacle, which was named in his honor after his death. 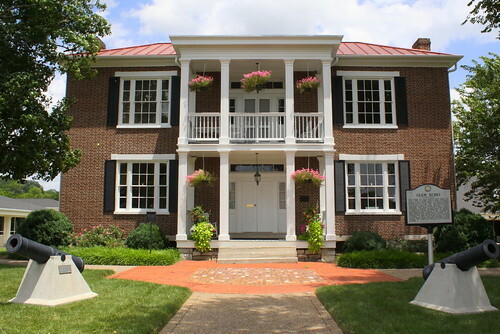 Glen Echo, also known as Harpeth Hall, is a property in Franklin, TN that was listed on the National Register of Historic Places in 1976. It is a former plantation house that is now the centerpiece and administrative office of the Battle Ground Academy's Upper School campus. It was designed and/or built c. 1828 by Joseph Ruff for Williamson County's first Circuit Judge Thomas Stuart. The structure includes Federal architecture. The NRHP listing was for an area of 14 acres with just one contributing building. It was one of about thirty surviving antebellum "significant brick and frame residences" built in Williamson County that were centers of slave plantations. It is one of several of these located "on the rich farmland surrounding Franklin"; others were the Dr. Hezekiah Oden House, the Franklin Hardeman House and the Samuel Glass House, the Thomas Brown House, the Stokely Davis House, the Beverly Toon House and the Samuel S. Marten House. 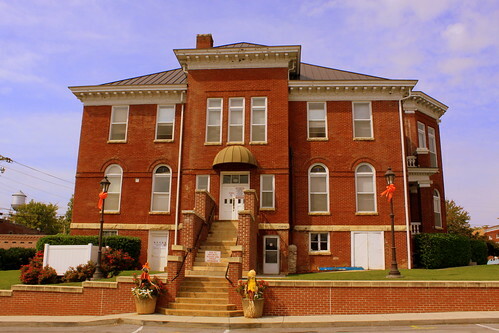 Every summer, the DeKalb County Courthouse is home to the nationally acclaimed Smithville's Fiddler's Jamboree. 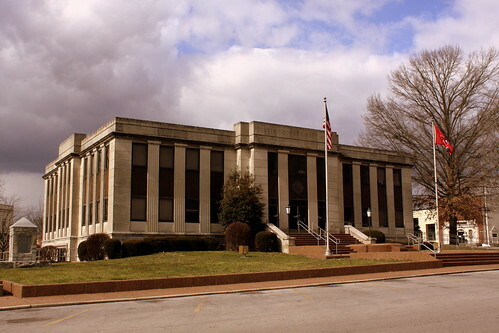 The courthouse was built in 1971 at a cost of $750,000. 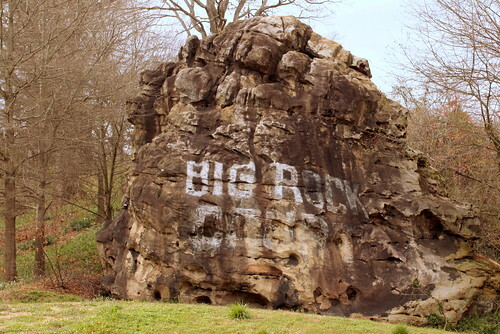 For years, motorists around Chattanooga have seen a Big Rock with the words Big Rock painted on it. This is the story. During the golden age of automobile travel, Joe Light opened a motel along Cummings Highway. This highway is located at the base of Lookout Mountain near the Tennessee River. Until I-24 paralleled the old highway, it was the only way that connected the city to the west, which meant lots of travelers passed through here. The most notable geologic landmark at this site was the Big Rock. Thus, the motel was called Big Rock Court and "Big Rock Court" was painted on the rock. 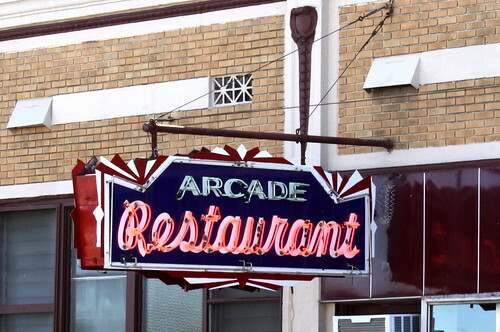 Even though it has been several decades, the makeshift sign is still legible. Big Rock Court wasn't the best motel around. It gained the reputation by the locals as a den of gambling. After a shooting, a police raid finally led to the Court's demise. This spot was still a prime location for tourists, so in 1977 the Super Water Slide opened for business. Advertised as the largest water slide in the world, the fiberglass slide zig-zagged down the hillside. The popularity faded until the summer hot-spot went out of business in 1989 and the slide relocated to Tullahoma where I find no record of it. With no use, this property became covered in kudzu. Local conservationist John C. Wilson let the group now known as the Lookout Mountain Land Trust to purchase the land and turn it into a park. Trash was removed, overgrowth was cut down and the park named after Wilson has opened. 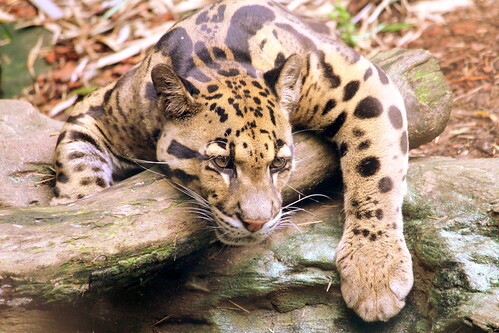 You can read Wilson's story on preserving the park in this article. Today, you can hike a trail, have a picnic, climb the old stairs to where Joe Light's house was, or get a better view of the Big Rock Court sign that beckons motorists to this day. In Opryland Hotel's original ballroom area, the walls are painted to depict scenes from Nashville around the time of Tennessee's Centennial, in the late 1800's. To view the entire set of 8, Click Here. 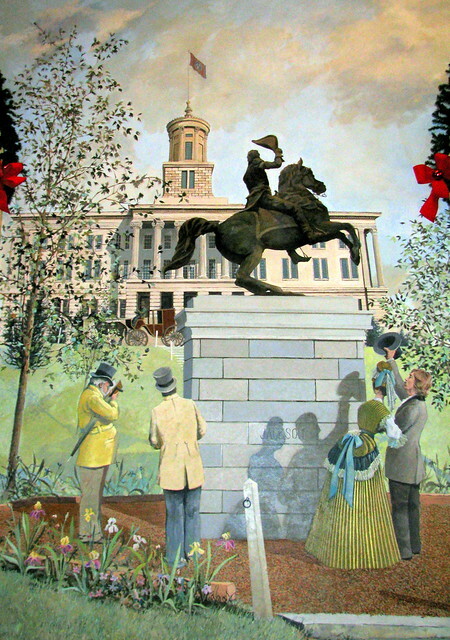 The Tennessee State Capitol was designed by William Strickland, who also designed the U.S. Capitol. 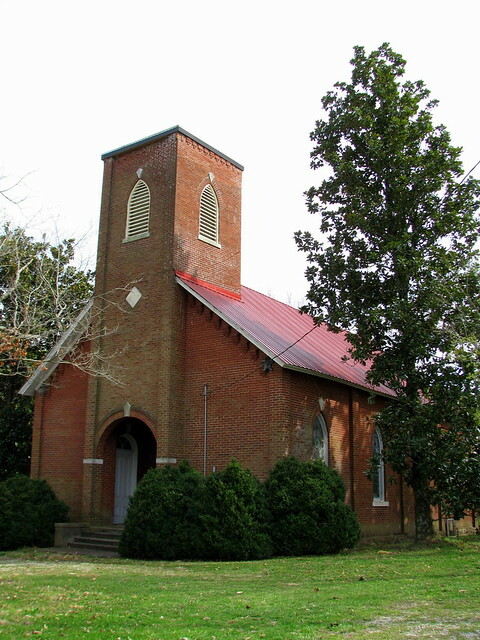 The building was finished in 1859. The Andrew Jackson riding statue was completed soon thereafter, and an identical statue was placed in New Orleans and one in Washington D.C. near the capitol. 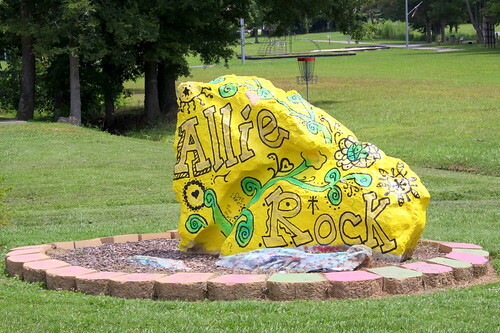 This rock is dedicated to the memory of Allie Blevens. Whether she was playing with friends or cheerleading, Allie always brightened the day of those around her. We invite you to express yourself by creating art or an uplifting message to brighten the world around you. 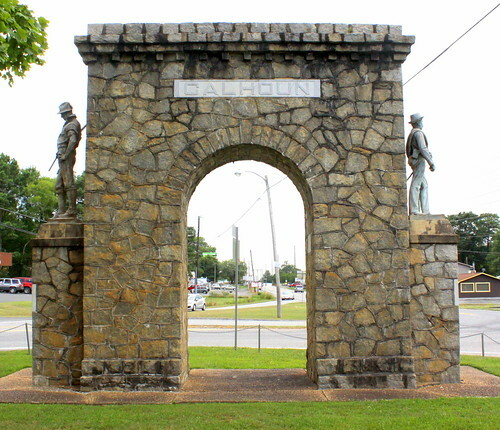 Located at the northern end of Calhoun is this memorial arch honoring soldiers. 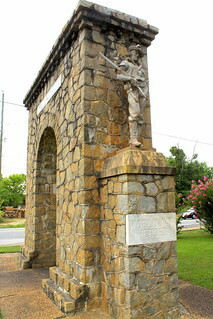 The arch is at a small triangular park where highway US41 (old Dixie Highway) meets GA225. 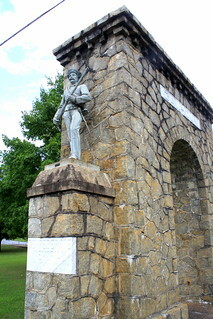 The Arch and nearby Sequoyah statue were funded by the Calhoun Women's Club in 1927. 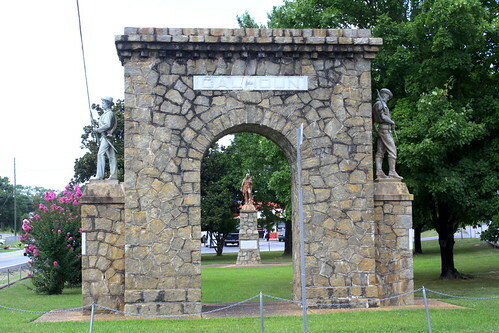 The statues were made by JL Mott Iron Works in New York. The stone masonry was completed by W. Laurens Hillhouse. 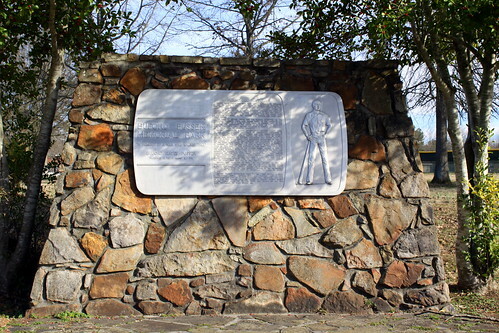 One one side is a Confederate Memorial which commemorates the Battle of Resaca which was fought near here on May 14-15, 1864. On the other side, "Calhoun honors her World War Heroes 1917-1918" featuring a Doughboy statue. 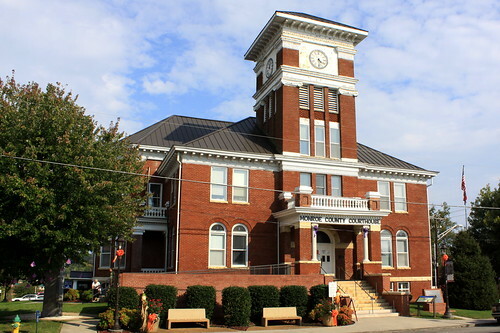 Cross Bridges is a small rural community in Maury County west of Columbia along US412. According to the sign out front, this congregation was established in 1882. Late during the afternoon of May 8, 1925, Tom Lee steered his 28 ft skiff Zev upriver after delivering an official to Helena, Arkansas. Also on the river was a steamboat, the M.E. Norman, carrying members of the Engineers Club of Memphis, the American Society of Civil Engineers, and their families. Lee witnessed the M.E. Norman capsize in the swift current 15 mi (24 km) downriver from Memphis at Cow Island Bend. Although he could not swim, he rescued 32 people with five trips to shore. Lee acted quickly, calmly and with no regard for his own safety, continuing to search after night fell. Because of his efforts, only 23 people died. Today. 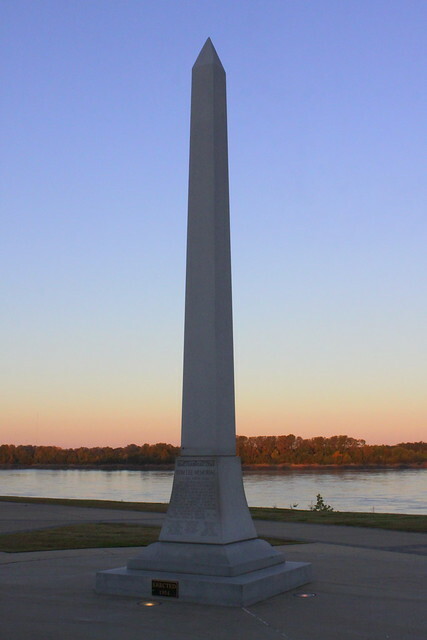 Tom Lee Park is a city park located to the immediate west of downtown Memphis overlooking the Mississippi River. Encompassing about 30 acres parallel to the river for about one mile, it offers panoramic views of the river and the shores of Arkansas on the opposite side. Tom Lee died of cancer in 1952. Two years later, the park was named in his honor and a granite obelisk was erected. 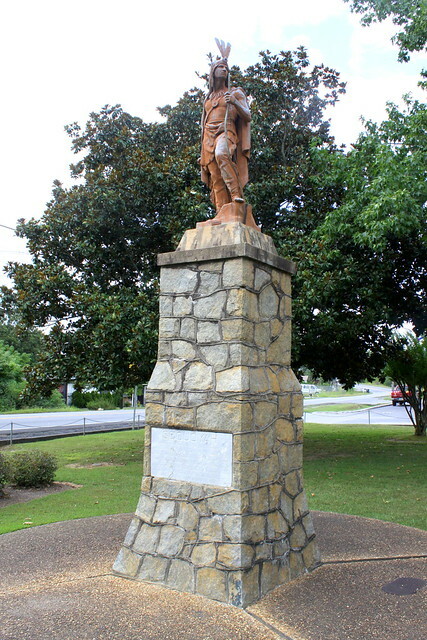 In October 2006, a bronze sculpture by artist David Alan Clark was erected in the park to commemorate the event and to honor the civil hero. The sculpture depicts the rescue of a survivor saved from drowning in the Mississippi River. 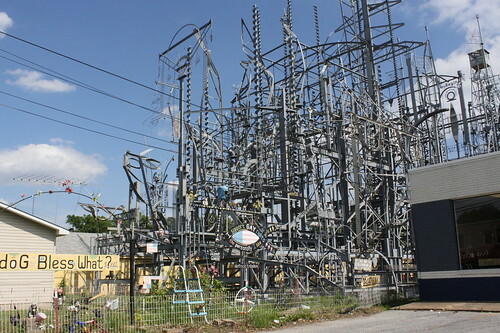 In late May, a strong windstorm powered through Memphis which knocked over this monument and shattered it into many pieces. Read the full story and see a video here. 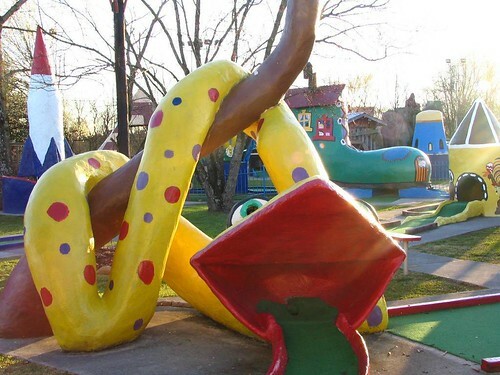 If you've ever had the desire to putt a small white ball into the head of yellow spotted python while in Dixie, then Goony Golf in Chattanooga, TN is for you. "In Memory of a Man Who Walked Tall"
This plaque at the park gives a short biography of his life as well as a relief portrait.